This month, Earth is receiving a very special visitor: Comet 46P/Wirtanen will adorn our night skies for all of December, ready for people to gaze at (likely with naked eyes) and to photograph. Interested? Then you should get ready—as in, now. The comet will make its closest approach to Earth on December 16, but the best time to view and photograph it may be as early as this coming week. 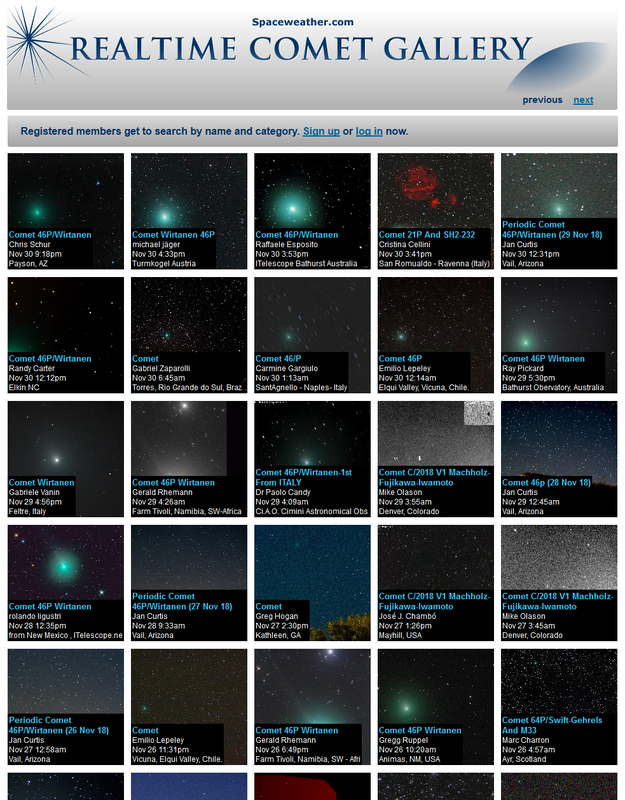 Below, Tyler talks about Comet Wirtanen—everything from where and how to find it, to where and how to photograph it, and more. Chris: Why does this comet have astronomers excited? Tyler: Comets are one of those amazing phenomena where every single time one of them shows up in the sky, it’s always different. Throughout human history, the sky has always been something that was thought to be eternal and unchanging. The stars always had the same constellations and those constellations came back each year at the exact same time. But comets would show up out of the blue—or out of the blackness—and when they did, you could see these great big tails sweeping across the sky, sometimes from horizon to horizon. So every time one of these comes along, you never know exactly what you’re going to see. You get one with naked-eye visibility maybe once every decade. I definitely know it’s been about a decade since the last one I saw with my naked eye, so I’m really excited about this. And if it gets more people curious and going outside, looking at the stars, and getting out to dark locations, then all the better. 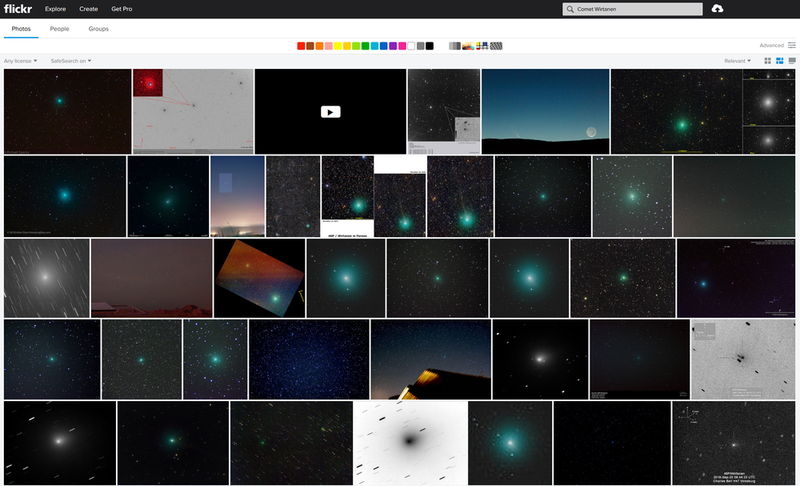 You can see photos that have been made of 46P/Wirtanen so far—mostly in the Southern Hemisphere—by clicking on these gallery screen shots of Flickr (above) and Spaceweather.com (right). Chris: A lot of times in the past we’ve heard there’s going to be a comet and then something happens to it—like it breaks up on the other side of the sun—and we never see anything. Is Wirtanen pretty much a guarantee? Tyler: There’s this quote: “Comets are like cats; they both have tails and they do exactly whatever they want.” So yeah, there have been loads of comets that have been announced to the public that in the end weren’t visible at all. But this one we’ll see. In fact, people are already photographing it. It’s been visible in the skies of the Southern Hemisphere already, and that’s only the beginning of the show. As it moves closer to both the sun and Earth, and as it gets brighter and bigger, it will be moving into the skies of the Northern Hemisphere. This is something that will be coming into view for those of us in the continental United States over the next two weeks, and if you are lucky enough to be within driving distance of some really dark skies, you should be able to set up a camera and capture this thing. It’s going to be bright enough and big enough. Chris: This should be pretty exciting for photographers. This is not a common thing that we get to shoot. Tyler: Right! In fact, my first attempt at astrophotography was in 1997 when Comet Hale-Bopp came along. That was the perfect comet because it was naked-eye visible for almost a year. You could see it from New York City. Especially back in the day when everyone was shooting on film and you needed time to develop it, look at the prints and then go out and try it again, you had a lot of opportunity to really hone the shot. That’s actually when I first got my interest in night sky photography. NASA offers a fun breakdown of what happens to a comet as it approaches the sun, enabling us to see it from Earth. Chris: What will Wirtanen look like? Tyler: Comets are balls of dirt and ice. They have very elliptical orbits, so they come close to the sun and then go far away. When they come close, their ice turns into gas, and the dust and the dirt that’s mixed in with it gets ejected, and you wind up with these great big glowing tails that point away from the sun. Well, here’s the problem with this comet. Its elliptical orbit at its furthest goes almost out to Jupiter, and at its closest it comes barely outside the orbit of Earth. We are going to be closest to Wirtanen when it’s at its closest to the sun. So what you’re going to have is the sun, Earth and this comet all lined up. The comet is going to be at opposition—it’s on the opposite side of the sky from the sun. What this all means is that its tail will be pointed almost directly away from Earth, so the comet probably will look like a great big fuzzy ball. That’s pretty neat, but it’s not what we think of as these giant swooping tails that arch across the sky over 40, 50, 60 degrees. It will be a big fuzz ball, but one that’s two to three times the size of the moon, so that’s pretty darn neat in my opinion. Chris: Where exactly on earth will the comet be visible from? Tyler: It’s really moving and brightening at just the right rate, in just the right direction, so that pretty much everybody on earth will have a great shot at this thing. Chris: Where should a photographer look in the sky to find it? Tyler: It’s going to start off early next week in the constellation of Eridanus. As you see Orion rising in the east, lying on its side, the comet will be rising before it. At around midnight, looking south, it will be just off to the right of Orion toward the west of the constellation, and it will be moving northward and passing by Taurus. It will be going to The Pleiades, and eventually around Christmas it will be visible through the constellation of Auriga. 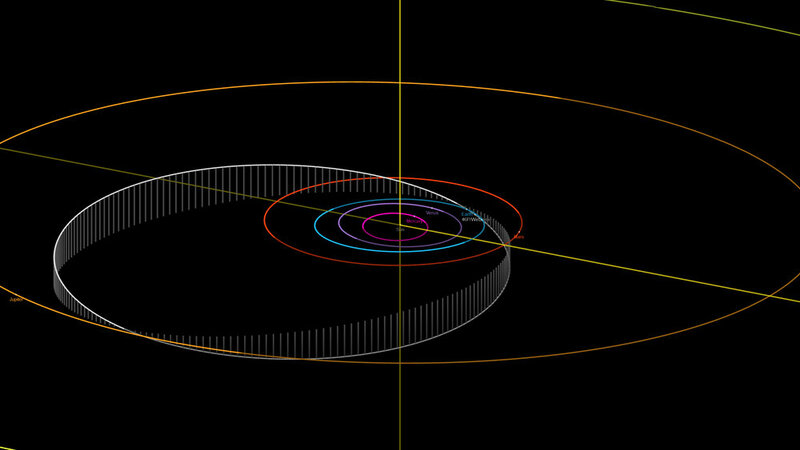 Courtesy of a NASA widget, a view of Wirtanen’s route on its 2019 visit near Earth. Chris: How dark does the sky need to be to see and shoot Wirtanen? Will we be able to view this from the suburbs, or do we need to get out into the hinterlands? Tyler: You’re going to want to get out into the hinterlands. Currently I’m seeing the comet as maybe around 4th magnitude or 5th magnitude, and it’s predicted to get to 3rd magnitude. For those who may not be familiar with the magnitude scale, the smaller the number, the brighter the object is to the human eye. In a dark sky location, a pristine location, we can see stars as faint as 6th magnitude. So for this comet getting to 3rd magnitude, that’s like Polaris. That should be easily really bright. The problem is, it won’t be a point of light. All that light, all that brightness, will be spread out over an area a little larger than a full moon, and up to three times larger. So it’s like taking a 3rd magnitude star and smearing it out over this large space. For that reason, if you’re someplace with light pollution, the comet will probably appear too faint. So you really want to get out to as dark of a location as you can, so that that background sky is as dark as possible. If you want to determine the best dark-sky areas near you, check out DarkSkyFinder.com, which maps dark sky areas around the globe. Chris: How will the moon cycle affect the best time to see the comet? Tyler: Next week is going to be new moon, and that’s when you have your darkest skies, your darkest background. But after that, the moon starts to come into the sky. By the time the comet is at its closest to us, about December 16, the moon will be brightening up the sky and probably making the comet harder to see with your naked eye. But at that point you should probably still be able to pick it out with the camera. Chris: In terms of exposure, will this be like photographing a dim section of the Milky Way? Tyler: Exactly. Your camera will pick up more light than your eyes will. As an astronomer—especially when it comes to comets, I don’t want to say anything definitively—but I feel like I can honestly say that there should be no doubt your camera will be able to capture this. Comet 46P/Wirtanen, courtesy of Knight Observatory, Tomar, Portugal. Chris: Should photographers just use whatever exposure they would for a general star photo? Tyler: Yes. The comet—unlike stars or galaxies—is moving against those background stars. So from night to night it’s actually moving from the south toward the north, which means as it’s rising from the east, it will be moving from southeast to eventually northeast. By the time we get to the end of the month, the comet will have moved so far north that it will have become what’s called circumpolar, which means it will never actually set behind the horizon over the course of the night. So it will be moving around quite a bit, but for the next week or so it will be slow enough that in a typical exposure that you would use to capture stars or the Milky Way, the comet probably would not appear to move relative to the stars. Now, I have seen predictions that say by the time it gets to be the closest to us—so, around December 16—it will be moving fast enough so that while looking at it maybe through a pair of binoculars or a telescope, you might actually be able to pick out its motion against the stars with your own eye. So at that point you should be aware of the fact that during a long exposure the comet might show some movement in a long exposure, and you may have to compensate for that. Chris: Because it’s moving around so much, it sounds like that will allow for different creative possibilities, and different composition possibilities, every night. Tyler: Right. In fact, one of the things that I’d recommend is starting early next week, go out at a certain time every evening and photograph this thing as it moves from night to night. Then you can composite all those photos together to create a multiframe exposure, or a time-lapse. Heck, if you do a really good job of this you could probably even create a movie of the comet moving against those background stars—and it’s going to be moving through some really neat stars. Also, think about the focal length of your lens and what kind of field of view you’re going to have. If you’ve photographed the moon, how big does the moon look in your field of view, depending on what lens you use? Imagine the comet in a similar way—it’s currently about the size of a full moon, but eventually will be possibly two or three times larger. Comet 46P/Wirtanen, courtesy of Victor Ruiz, Siding Springs Observatory, Australia. Chris: How about shoot locations? What national parks might be best for photographing Wirtanen? Tyler: You’re looking for a combination of dark skies and clear skies. There are some wonderful dark skies all around the Great Lakes, places in Michigan like Sleeping Bear Dunes National Lakeshore, but you can get some terrible weather up there right about now. So my suggestion would be to head to the clear, dry parks of the American Southwest. The best park will be Death Valley. And Great Sand Dunes could be really nifty—to be there amongst the sand dunes, with the Sangre de Cristo Mountains off toward your east just as your comet is coming up. The last comet I photographed was in December 2007, and I photographed that in Chaco Culture National Historical Park, amongst some of the ruins at night. I’d really recommend places in the Colorado Plateau—pretty much any of those places with a good view toward the east and the Rocky Mountains when the comet is rising. That will give you a good opportunity to capture the comet against some interesting landscapes. Chris: It’s been a great couple of years for astronomical events. Last year we had the solar eclipse, this year we have the comet. What might be coming up next year that photographers will be interested in? Tyler: There’s going to be a total lunar eclipse that comes along January 21. Everybody in North and South America should have a wonderful view. If you haven’t seen the moon turn that wonderful dark blood-red as it goes into Earth’s shadow, this is going to be a perfect opportunity to see and photograph it. We also have a couple of solar eclipses for those folks who caught the eclipse bug from last year. There will be a total solar eclipse in southern South America on July 2. You’ve got to be in Chile or Argentina—the path of totality will be visible only across the Pacific Ocean and then over those two countries. I’ll be co-leading a trip in Chile for this eclipse, with a group called Betchart Expeditions, which partners with The Planetary Society. Then there will be an annular solar eclipse happening right about Christmas 2019. An annular eclipse is when the moon is a little too far away from Earth, so it doesn’t completely block out the sun’s light. That alignment is perfect for getting a ring of fire visible in the sky. That will be visible in Singapore and across parts of the Indian Ocean. Note: We’d love to see your photographs of 46P/Wirtanen. Feel free to share them in the comments section below, post them on our Facebook page, or upload them to Instagram and tag us @nationalparksatnight.